Last November I attempted my first NaNoWriMo, but since I’m a turtle-paced plotter and not a fast-fingered pantser, I approached it like this: A Slow Writer’s Scheme to Win NaNoWriMo. Despite that excellent plan, I didn’t win (see Results of a Slow Writer’s First NaNoWriMo). There were two reasons for that, one of which was that I started a new freelance writing gig mid-month that ate up most of my time, and the other was that “pushing ahead” on my project, something NaNo encourages, did not work for me. Despite all my preplanning, my story simply wasn’t ready to be churned out in one go. I hit roadblock after roadblock because I hadn’t developed something crucial regarding the story or the characters, and had to go back to change things, and try again. Which, I suppose, is what writing is all about. But I’d rather develop those things before I get into the messy process of writing. So what was I missing? This is something I’ve been struggling with for years: what exactly needs to be developed before I start to write? I know how to beat out a story arc (Outlining Method 1: Story Beats) and hone a life-changing character arc (The Hero’s Emotional Midpoint). I even made myself a handy Pre-Writing Checklist. Yet my story outline still stinks! It’s like I’m stuck in the Outlining Outhouse, re-plotting, re-plotting and re-plotting, hoping to eradicate the stench. But I can’t, so I burn it down and dig a new hole – only to fill it with more crap. In desperation I turned to more writing craft books. After a few useless misses, I found THE ANATOMY OF STORY by John Truby. It is exactly what I need: story development steps to go through before one starts writing. Truby also stresses that this approach is for all writers, plotters and pansters alike. Why? Because it’s less about story structure (i.e. this action happens here and is followed by this action and then this action, etc.) and more about story elements that are needed to create not just a good story, but a great story. And I think that is the most valuable aspect of Truby’s book — discussing what makes a story great and giving the reader actionable questions to answer to develop that greatness in their own work. And what makes a story great? A Moral Argument. Some of you might be going, “No kidding! I knew that!” Well, so did I. But it’s a very difficult thing to write. It must be woven so seamlessly into the plot that it won’t be seen by the reader but rather felt. That’s what I was going for, but I wasn’t quite hitting the mark. I’m sure with enough practice I could have got it, but I want to have a great novel published before I’m 80, so I’m ecstatic that Truby has written a book to speed up this learning process. Because this outhouse reeks and I cannot wait to get out of it! 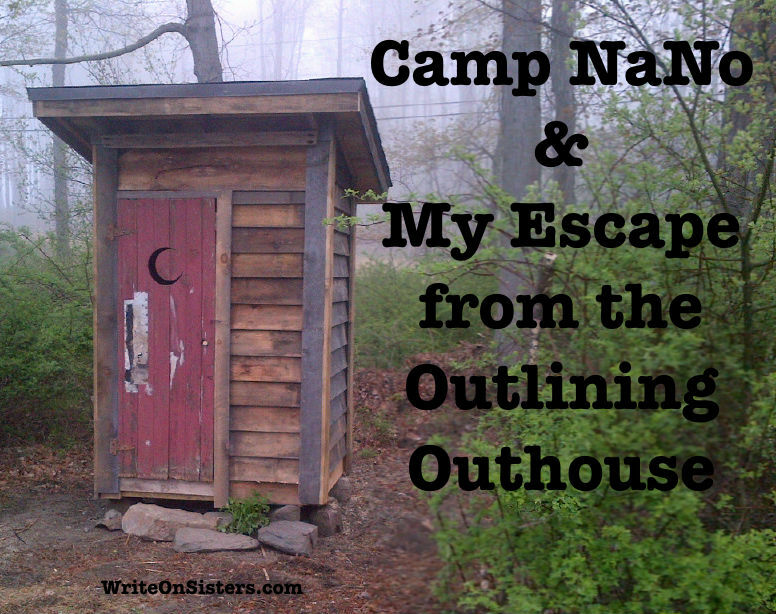 So for Camp NaNo, my goal is to not spend all my time in the outlining outhouse. The plan is to work my way through THE ANATOMY OF STORY to develop my novel idea, and then write an outline that hopefully won’t completely stink. I’m sure I’ll find myself in the outhouse every once in a while, but at least now I know how to escape it and write a better – no, great! – story. Any of you guys going to Camp NaNo this summer? I’m terrible for skipping about when I’m writing. I jump forward to a more exciting part, then back to something else, then I fill in the gaps…I wonder if I’d have more luck by actually writing an outline! Never been able to do NaNoWriMo, Heather. Too many things going on in my life! Also I am a pure bred pantser, which mean I write in fits and starts, no outlining, outhouse or not. I might take a gander at that book, though. Definitely check out The Anatomy of Story. I think both pantsers and plotters would find it helpful! I’ve never participated in NaNo. I don’t think it’s for me. Maybe someday. Good luck. 🙂 I had heard of this book so will have to check it out. Thanks! Yes, do! There are so many writing books out there, and not all of them are helpful depending on what the writer needs, but if you’re looking to make sure you’re building a story on a solid foundation, The Anatomy of Story might is a great tool! I did sign up for Camp this July – and plan to develop my first draft in these 30 days. Doesn’t really fit their word count goal, but it’s mine. Cool! I wasn’t ready for the April Camp, and was happy that there’s one in July. Depending on how well my outline comes together, hopefully I’m ready for some fast writing in November! I will for sure try 50 k next camp to kick off, hopefuly, a writing frenzy for Nano later this year. Thanks! Good luck to you too! I’m sure you’ll manage to make one of those drafts shine, or else learn from them and move on to a new one. ?